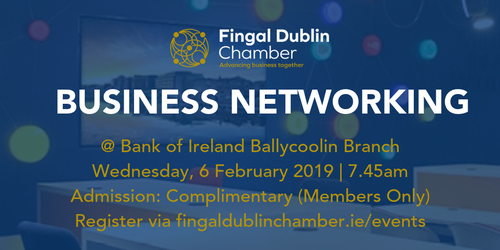 This event will help members to find out more about each other, with the potential to build relationships, create leads or find assistance with current business challenges. The event will feature a selection of members delivering short pitches to all attendees, followed by an open networking session so please bring along plenty of business cards. Attendees may park their vehicles in the designated Bank of Ireland spaces in front of, and behind the Ballycoolin Branch, and also in the overflow car park next to the coffee shop. A member of staff will direct you. This is a members only, limited capacity event, with only 7 spaces remaining. To ensure your place register now.